If someone had told my fourteen-year-old self that my future self would love wearing graphic tees, my former self would have laughed incredulously. Needless to say, my perception on that article of clothing has changed quite a bit, especially since I've discovered the arts of typography, minimalism, and sarcasm. In all seriousness, a graphic t-shirt is the ideal cross between an athletic tee and a nicer shirt, with a bit of fun and whimsy thrown in; it's practically perfect in every way. Trust me when I say that there is a graphic tee out there for everyone. Whether you peruse Nordstrom or Forever 21 or even Society6 (the mecca of graphic design), you'll find a graphic tee that's perfect for you and your style. And if you need a jump-start, I've linked several tees down below--happy shopping! What is your opinion about graphic tees? I was the same way! I used to not like graphic tees, but now I think they're adorable!! I'm glad that someone else went through that transformation! Thanks for reading! I saw someone wearing that eyelash tee in a meeting the other day and thought it was absolutely adorable! I'm very picky about my graphic tees, but I think it's so much fun to wear them with skater skirts! Isn't it? I'm also very picky when it comes to picking these tees out (but not nearly as bad as I used to be)! 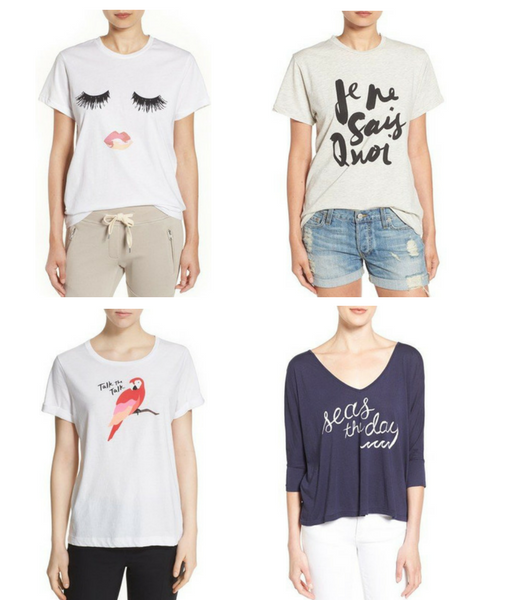 I love these graphic tee picks! I'm the same way, I used to think they were so weird and ugly and vowed to never wear them. Now I see them every where and love them! Love your blog Tori! Isn't it ironic that so many people have gone through that thought transformation? Thanks for reading, Addie! I hope the "cute" graphic tee is here to stay! Wildfox has some of my favorites. I share the same hope! Thanks for reading!